If you were invited to attend a conference to hear from such esteemed Christian writers as Philip Yancey, Luci Shaw, and Richard Foster on the art of writing, would you go? What if it cost you less than twenty dollars to attend? 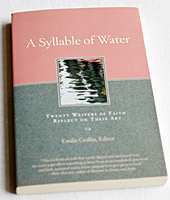 Pick up a copy of A Syllable of Water: Twenty Writers of Faith Reflect on Their Art (Paraclete Press, 2008). It contains all the nourishment of a life-changing conference on faith and writing, including perspectives on poetry, prose, creative nonfiction, memoirs, and plays; recommended reading lists; and a meditation on what it means to be a Christian and a writer. Syllable, edited by the celebrated spiritual writer Emilie Griffin, springs from the shared expertise of The Chrysostom Society — a community of writers who have collaborated and encouraged each other for nearly 25 years. Among them are influential minds such as Seattle Pacific University graduate Eugene Peterson ’54, and Gregory Wolfe, publisher of Image journal and director of SPU’s MFA program in creative writing. Syllable highlights thoughts from Harold Fickett on a writer’s daily discipline, and how “writing, when undertaken rightly, can assist in our own redemption.” And the line-up includes reflections from Philip Yancey on journalism, Richard Foster on spiritual writing, Scott Cairns on poetry, John Wilson on relationships with editors, Diane Glancy on playwriting, and more by Dain Trafton, John Leax, Rudy Nelson, Keith Miller, Doris Betts, Virginia Stem Owens, and William Griffin. Editor’s note: Don’t miss Emilie Griffin’s exclusive essay for Response on spiritual discipline in lean times. The early American Christian music “Sacred Harp” is back in a big (loud) way. Renowned writers such as Luci Shaw and Philip Yancey share tips. An SPU alumna and adjunct professor tells how a nation’s music is keeping its culture alive.